The social media scoring service that seeks to rate how influential individuals and businesses are on social networks has launched an iPhone app designed to have subject matter experts deliver answers to questions from other users. “Whether you’re redecorating your home, gardening, furniture shopping, parenting or raising pets — Cinch has the people with great advice to make every decision easier. Just tap in a question, and we’ll connect you to the people with the best advice,” states the App Store description. Other online players have tried to crack the Q&A nut in the past. Quora is probably the best known site that invites users to participate in a forum-style social media network where anyone can ask or respond to questions, or subscribe to topics to see when questions in that topic are posted and responded too. Klout has recently launched some other services diverging from its model of identifying influencers for brands to provide perks to in exchange for some word of mouth advertising. Klout for Business rates content a business is posting to its social channels and how successfully it is attracting attention, and has been available in beta mode since Spring. 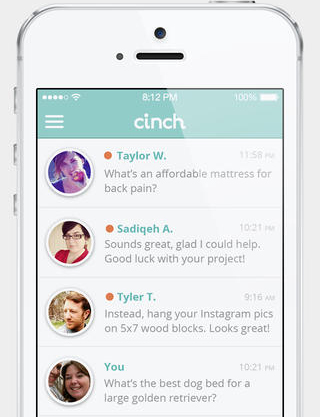 Klout says an Android app is coming soon for Cinch. ITBusiness.ca tested the app by posting a question to Cinch: “I’m writing an article about Cinch right now. What should I say about?” But received no answers after three hours.